I've posted this in some local forums, but with such a specific question (and much larger community) I thought I might have better luck here. I've been using HPA on my KJW M700 for a while now, and the stock mag has really impressed me with its resilience to very high pressures. When I first started to use it I followed the recommendations of snipers who came before me, who said not to use it with more than 120 psi. Ever. Accidents (failed regulator o-rings) and pressure testing have told me that the mag is actually capable of shooting for extended periods of time at up to 210 psi. While you could NEVER use this kind of pressure for airsoft since field legal speeds are reached at 90 psi, it's great as a coyote repellent and generally fun gun when it's shooting that hot. 1) Is it even necessary? The stock mag is aluminum and this is also aluminum. Unless it's much higher quality aluminum, I'm failing to see a justification for the $$$ price tag. 2) Would it provide the extra resilience I need? I'm not sure if this is even the part of the mag that holds the gas reservoir. 3) What PSI levels have these mags been used with successfully? All advice is greatly appreciated, especially since these parts cost an arm and a leg. I'll make this very simple for you! I have been using my tanaka on HPA for 7 years now. 2 years using the long tanaka mag on hpa. I can tell you with absolute certainty that the 29rnd mag can handle over 300psi for as long as there is air in the tank. So don|t worry. The mag won't break even at 400psi as my regulator failed once and it was set at over 400 psi. Nothing happened. The only thing you should wrry about, is the bolts capability to release the pressure in the mag. The gun is capable of reaching well over 1000fps using 0.2g bbs. y personal best is 1090fps (didnt have strong enough striker spring to go any further). 1) Yes, more bbs per mag. 3) 300-350 in the backyard. 190-210 at fields (700 fps). well over 400 at stress test. LeStath that's both scary and very impressive, I'll have to give it a shot(literally) once I get my x2 29rnd Taped + HPA rig(in the mail) and my second M700! What sort of accurate engagement distance are you able to reach. BB weight? I'd also be very interested in what upgrades you've got in it. The CNC bodies were created to address a specific problem. Although I can't remember if it was the police or AICS model but the slight swelling of the mag under pressure was enough to make removing it from the magwell a real pain in the rear. This was only seen with green or red gas on hot days. The CNC'd body doesn't add anything to efficiency nor durability. Also, do not confuse that problem with tight fitting Tanaka brand short mags in the KJW police model. A magazine will fail at the o-rings long before the metal explodes. This was AICS problem with the 29rnd mags.... Though I live in Greece and during summer we have 40 degrees Celsius and I always use propane never had any problems. LeStath... That's impressive how did you manage to get out 1000fps?! Did you make your own striker spring? Please give us a part list! Thanks for all the input! I went ahead and started using one of the long mags in my KJW M700 and I'm very happy with it. After replacing the strike plate with the King Arms one and slowly working up the PSI to look for swelling, I'm happy to say there wasn't any at up to 250 PSI (calipers around the mag proved this). On the topic of 1000 fps, my rifle easily shoots that at around 220 PSI. Even though a lot of the posts on this forum say that high pressure low volume is the way to go for consistency, I run my rifle off of a 13 ci. HPA tank situated in the stock, so I run low pressure high volume. I can usually get 550 fps at 85 PSI, which is the limit at my local fields and lets me get more shots out of my rig than I would otherwise. Fun fact is that you can get a sonic boom at around 1150 fps. With a madbull amplifier, this sounds AMAZING. Ear protection definitely recommended though, it's basically a gunshot. I would very much like to see the way you've got the 13ci on the stock, I'm currently in the process of doing that to one of my Tanakas. I've removed the clam-shell and plan to use an AR grip and then have the 13ci somehow placed on the stock but I'd love to see how you've done it. Also going to have to get a Madbull Amplifier now lol! Originally I had the tank clamped to the right side of the stock (I shoot lefty) with hose clamps, but this was cumbersome and had to be covered with a shemagh to even be a viable solution. Recently I got the idea to hollow out the center portion of the stock to skeletonize it, and place the tank in the resulting space. I finished hollowing the stock with my dremel today and will be reinforcing the remaining bits with carbon fiber wrap this weekend to make sure nothing bends. Pics for sure when it's done! I've actually removed my clam-shell panels and am going to hook it into the space that is left. But the 13ci is around 9Inches (1 1/2Inches to much). Will have to look into it more once I'm back home with the parts in my hand. This is how I did it. Although it's not very artful, it's at the very least functional and comfortable. I'm looking to have the stock completely redone in carbon fiber with the stock skeletonized right out of the mold so it looks better and has a more aesthetically attractive way of mounting it. I totally brain derped, I have an AICS but that was the general idea I had to do and then cover it up with a rifle stock pouch. Is that a Ninja 13ci? Is that a Ninja 13ci? It is, and that's actually very important. Some tanks have a piston/spring setup like the variable regulators we use to adjust PSI down to usable levels post-tank, but the Ninja regs are a shim-based system that's much more consistent, although not adjustable. I'm really happy with this setup, although I can imagine that doing this on an AICS would be...difficult I have no idea how you would accomplish that, but if you manage to do so my hat's off to you! As an aside, I'm taking the stock in this week to get evaluated for a carbon fiber and fiberglass mold. If it doesn't cost too much I think it'd look more elegant than this haphazardly created frankenstein thing, not to mention allow me to design it from the ground up to hold the tank in the stock and the regulator in the handguard. Well I've got two AICS to play around with, one I'll mount the tank by completely removing the clam-shell body and the other I'll either dremel to work or I might just use it as a battle-rig set-up. Whats the weight distribution like on that? Also if you can't/don't want to spend the money I would get a rifle stock pouch and it would cover it really well. The weight isn't too bad, especially if you throw a muzzle device on the other end. Even with the tank and the reg installed, a stock AICS is heavier by a couple pounds. With the ninja tank and a TM Mac 10 silencer on the other end, you can hold it just forward of the magazine and be completely balanced, which is great. With this particular setup I usually wrap a dark shemagh around the tank area, so it both covers the tank bits and acts as a nice cheek riser that makes shooting surprisingly comfortable. Yeah, to make it shoot 1000+ fps I custom cut a spring from a hardware store to the correct size. Although I managed to get 950-980 fps on the G&G striker spring. I have never broken the sound barrier on mine though, and I don't get how ZopS get the gun to shoot 700 fps on 220 psi, as I use mine at around 200-210 to shoot 700 fps with a stiffer spring than the G&G striker spring. I have no doubt he gets it to shoot 1000+ fps, but not at that PSI level. If he does, then that's amazing. I just don't see that happening as I have zero leaks and only get around 7-800 fps at 220PSI. regarding range and such, I used to get 320-340 feet of range (man size target) with a regular VSR hop (9ball) and a PDI 555mm 0.1 barrel and madbull 0.40g bbs. Now, on the other hand, I get around 380-410 feet of range (man size target) with a prommy 6.03 (some how more accurate with 6.03), ER hop, and elongated bucking (to fit the ER hop nicely), and BBb<AT>stard 0.40g bbs. All ranges are shot at 700fps (field limit). Fun fact: Installed a R-hop thingey on my custom Hi capa (6.01 303 mm IB, custom 250ish % hammer spring, r-hop) and was pulling 250-300 feet kills on my co2 magazine this weekend! Haha! All the guys were shocked, me included. 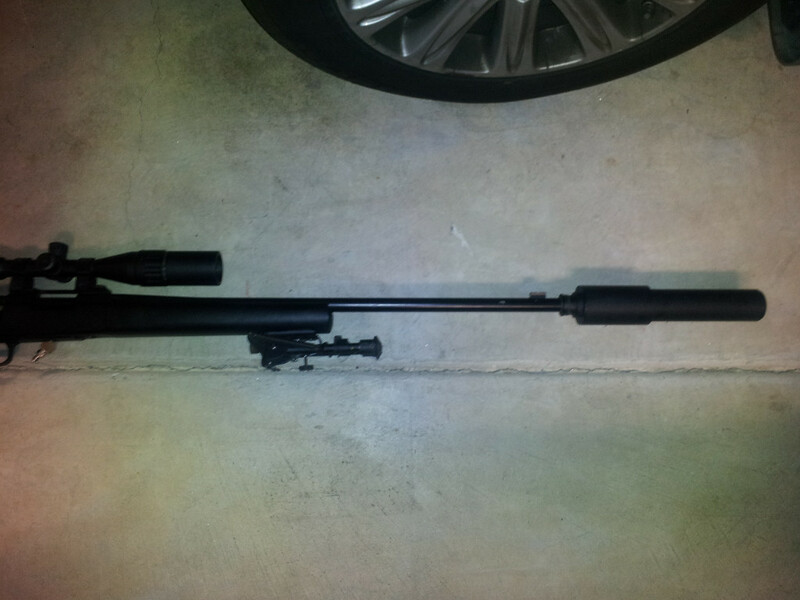 And now I'm seriously considering making a semi sniper around it with stock and scope and all of the other cool stuf. What do you think? I edited in a picture of the gun with winter camo, just for fun. To be honest, I'm not sure how it's working either. I'm heading out to get my tanks refilled tomorrow at the local paintball shop and then to AEX San Diego to pick up some christmas presents, so I can take some chrono station vids there and detail the setup. With regards to range, we seem to be pretty similar in what we can achieve. For the longest time I was a fan of the super heavyweight madbull bb's, but recently started testing the Bioval .27g BBB glass things at really high velocities. The results were pretty amazing. Unlike the other bb's, which had something of a lobbing effect even when dialed in, these things shoot like they follow a laser beam out of the barrel. Maybe it's because they're so much smoother/smaller diameter in a 6.01 barrel? Those Pearl bb's look amazing, but 12 bucks for a pack of eight? I'd break the bank just sighting it in! I've been wanting to get a hold of white (basically anything not black), smooth, heavy bb's for a long time, so if those ever come down in price you can bet I'll be one of the first in line. That hi-capa sounds like a beast! My TM Mk23 gets pretty good range with a KM extended inner barrel (250mm? not quite sure) and hi-flow valve, but if you could make a reliable semi-auto sniper, you'd pretty much be hitting the holy grail when it came to follow up shots. It's the only thing that I don't like about my M700 setup. I've been toying with the idea of tapping an old KJW Mk I and using it as a semi-auto sniper, but I ran into trouble when I was looking for reinforced parts, especially when it came to the striker spring. The gun even has space in the stock for a mini CO2/HPA tank already! 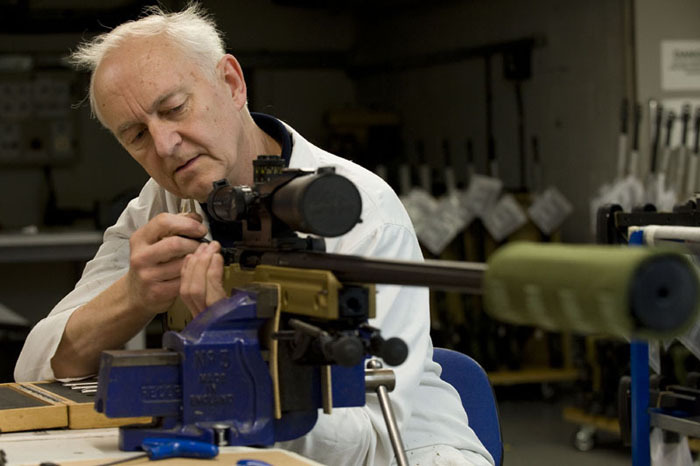 LeStath that Tanaka M24 it's only one Tanaka I like!! Yeah, would be nice to see your setup on a video. maybe I have been missing one crucial part for all these years and I will finally be able to push 1000 fps out of it on no more than 220 psi, although I doubt it. Comparing to others, my setup is about the same in regards of psi and fps. You talk about range. Well, when I first started the Tanaka project way back in summer of 2006, my range was around 100 feet. You can say I've come a long way from there. I also always had the impression that tighter was better in regards of accuracy. Lately though, I have found that this is not the case. 6.03 in fact is the sweet spot for shot to shot accuracy. The fact that the bioval 0.27 clear bbs are so accurate being that they are small, only strengthens the theory of 6.03 barrels are more accurate for normal bbs. In regards of the Pears, those are something else. I have only shot around 50-60 of them. though I only payed $4 for them (shipping). Unfortunately the Pears most likely will never be sold at a large quantity at a reasonable prce being that each and every bb is CNC cut and all. Now I feel like a bit of a douchebag. My trip to the shop today revealed that the chrono they use isn't really effective for measuring velocities in excess of 750 fps. It pretty much refuses to display anything higher than 800, even when I changed the PSI all the way from 220 to 300. The only reason I'm not suspecting the striker spring on this one is because the gun was getting louder and louder, which I think is indicative of more air being released at the higher pressures. I have an F1 Chrony coming on Saturday as a holiday present from a good friend, and I'm pretty confident that those chronos are the be all end all for velocity claims. I'll repost when I have my new toy in hand and all set up. At the very least I've got a video of the current setup en route to youtube as I type this, and that setup's not going to change anytime soon. LeStath, your pistol story inspired me to finally take the plunge on converting a KJW Mk I into a semi-auto HPA sniper. I got a good deal on one today along with a 555mm laylax 6.03 barrel and a firefly hard bucking, and it shouldn't be hard to drill/tap because the fill port will act as a guide hole. I've spent way, WAY too long on this M700 project, so I'm glad to finally get a little variety on my workbench. I was thinking of using the money for the above on a MK43 so I could have a support style weapon...but my heart belongs to sniper rifles. Looking forward to see some new results once your F1 Chronograph is in house. The gun most certainly is shooting hotter. I want to try to make my gun breach the sound barrier just for fun next weekend or something. I'll post a picture of mine when I get home next Wednesday, pretty much some cotton and cut up packing peanuts stuffed into it a canvas sleeve and then sown up and slipped over the suppressor. If you don't know the reason they use these is because suppressors absorb a lot of energy which is converted to heat and it can cause a the scopes image to become warped. Also is some of the drier areas of the world you could actually start a bush fire if you've fired several rounds down-range and then let the suppressor touch some dry grass. Here is mine that I just re-finished, wasn't happy with the materials so I got some 1000D Cordura Khaki and some Khaki Nomex sewing thread. Its made up of 4 layers the outer being the 1000D then a layer of cotton blanket then 1000D and another thinner length of black cotton. Copied the SAS2 military design which has elastic on both ends and is pretty much stuck on the suppressor. I really wouldn't suggest making it yourself unless you've got a sowing machine that can handle the 1000D and actually have some experience using it. That's quite a big FPS range, low being 625.9 and high of 648.1, not something I'd expect of a HPA rig. I agree. My CP Reg isn''t exactly broken in yet. That was a video I took very recently after assembling the rig. It took me longer than I wanted to get around to it, but here's my proof of shenanigans. I kinda hate the ammo I shot, which is why I was shooting it (trying to get rid of it). Fps is slightly low because of the long silencer, which I had to use so as not to scare the neighbors. I'll be doing another one with higher fps later. The backstop I used for this wasn't quite up to it. Edit - the standing reading before the first shot doesn't count either; it's from am earlier batch. Regarding chrony; I think I'm in the market for a new one. any suggestions? (must be able to read up to 1000fps accurately). I'm getting an F1 Chrono, I think they read between 50FPS to 8000FPS and you can even chrono shotguns so that is what I'm hopefully going to purchase this weekend. My local shop uses the Xcortech Chronograph and that seems pretty good measureing FPS/BBS but someone told me the more space there is between the measuring points the more accurate reading you'll get.